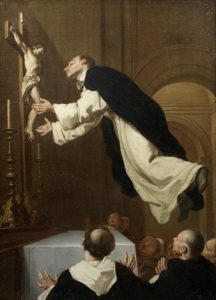 Far more impressive and splendid than all St Domini’s miracles, though, were the exceptional integrity of his character and the extraordinary energy of divine zeal which carried him along. Without difficulty he found his way into people’s hearts as soon as they saw him. Everywhere, in word and deed, he showed himself to be a man of the gospel…. Everybody was enfolded in the wide embrace of charity, and since he loved everyone, everyone loved him. He made it his own business to rejoice with those who were rejoicing and to weep with those who wept. He was full of affection and gave himself utterly to caring for his neighbors and to showing sympathy for the unfortunate.